With white trim and white doors throughout the house, the home’s previous owners had gone with a pecan color for the kitchen. Along with a peninsula that cut it off from the rest of the house, this kitchen “just didn’t belong. It didn’t make sense. You scratch your head and say, ‘I don’t get it,’ “ explained Jim, who is president of Kitchen Kraft, a full home design/remodeling firm located in downtown Columbus, Ohio. So the couple came to Jim to gather some cabinet and other options. The husband’s father had been woodworker, and with that background the homeowner understood woodworking quality, fit and finish. “They were looking at other lines, but when they came to Grabill he was done. That was the one for him,” said Jim. As the owners and Jim discussed other parts of the house, it became clear that a whole house makeover was needed and Jim was launched into what proved to be a three-month project. 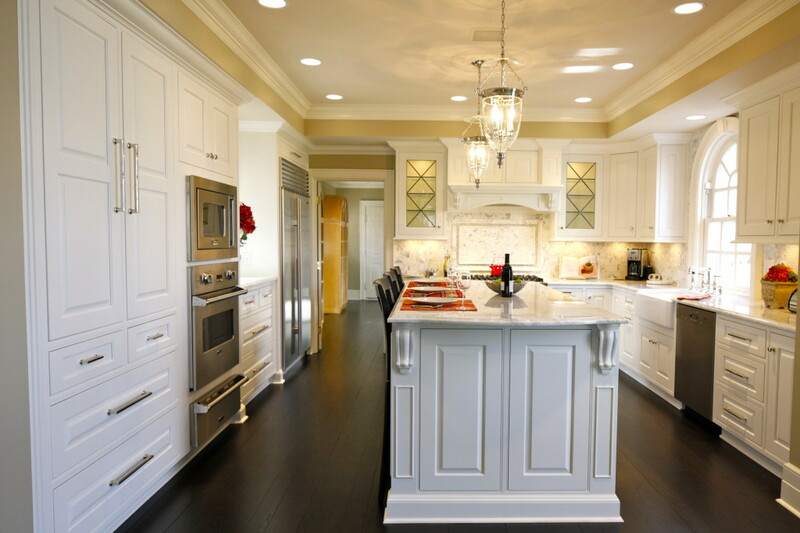 In the midst of it all, the kitchen remained a primary focus and Grabill’s custom capabilities proved invaluable in fulfilling the design Jim envisioned. “Everything but the refrigerator and sink was relocated,” said Jim, who used an inset Georgetown door style in maple, with a super white finish that perfectly matched the doors and trim throughout the house. 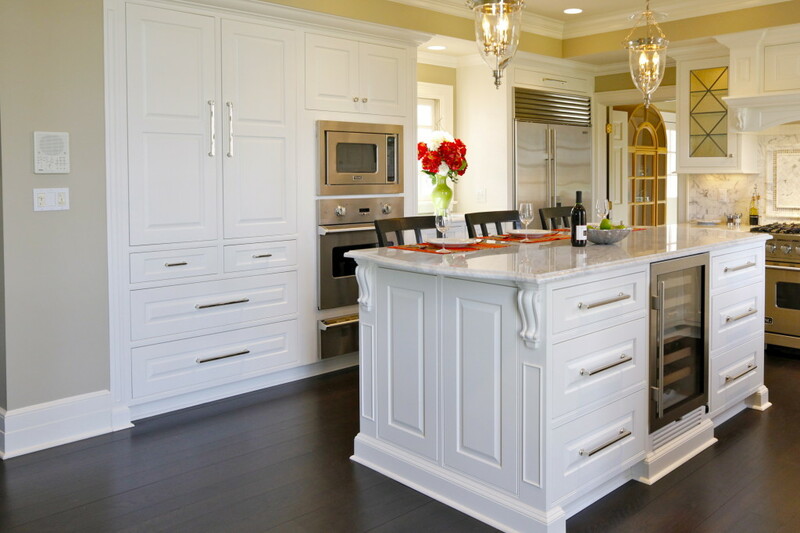 Cabinetry that normally might be three or four separate units was created as one piece to provide a seamless look. Replacing the peninsula with a taller than normal island, 40 inches vs. 36 inches, to break the even plane with the surrounding countertops in Carrara marble, while also containing a standard-sized beverage center. Grabill had to build taller cabinets and also a mid island platform for the beverage center as well as a custom-made grill for the center’s ventilation. Mullion doors were fitted by a local company with antique glass to match similar glass in other parts of the house. A commercial range hood was vented through the attic and exterior brick wall. A combination of flat and raised panels were used for the drawers. Special molding and corbel touches throughout. Jim found Grabill’s help with all the custom details involved in these features immensely helpful. For example, “the hood design was impossible to figure out,” said Jim. “I took the concept to Mike Gross at Grabill and he started asking questions to get the right size corbels, make sure the projection wasn’t too deep, and just make sure that everything was perfect. With his guidance we were able to achieve what we wanted. This kitchen is also featured in the Winter 2012/2013 edition of Signature Kitchens & Baths magazine.